It was a unique proposition. Realty company Century 21 was in search of a way to quickly bring together its more than 70 individual YouTube channels into a single channel. Its dozens of disparate channels weren’t exactly broken, but they weren’t exactly maximizing user experience, either. Prior to working with Noble, Century 21 Realtors from across the country would submit standardized videos that displayed a property’s price along with still images, property information and a URL. The problem was there was no single home for all of the videos. What, for instance, would someone in Chicago do if they needed an easy way to find a property in San Francisco? They’d search and search, and maybe eventually land on a competitor’s site, with Century 21 losing a potential buyer. Century 21 needed a way to aggregate all existing channels into just one custom channel, creating a richer experience for all. Our developers were chomping at the bit for an opportunity like this. Noble Studios combined the technologies of YouTube and Google Maps to create a database of searchable properties. Matching homes are shown on a user-friendly map. Potential buyers can click through to see videos of each property. Users can opt to view results on a grid, allowing for more results and details on a single page. The result was that we blended technologies from YouTube and Google Maps to create a database of searchable properties. 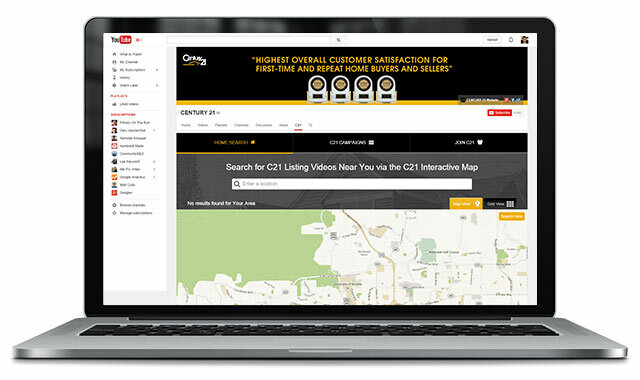 Now, when users visit the Century 21 YouTube page, they’re presented with an easy to grasp map and clearly delineated search bar that lets them find homes and land for sale in any part of the country. It was a quick, real-time method of aggregating data and funneling it into another channel. Which, as our developers will tell anyone who asks, is pretty badass. Within two months of launch, the site had picked up nearly 2,500 page views, with users spending an average of 58 seconds on the page. More than 107,000 property listings now are housed on a single, searchable map, pulling from 74 individual pages. More than 2,000 listings are added to the custom page each day, allowing Century 21 to leverage its vast database of properties to a YouTube audience.